Flexible working has a whole new level of meaning with Herbalife Nutrition. Free yourself from the restraints of the ‘9 to 5’ routine –design your schedule and define your own working hours. Build your business around your lifestyle. When flexibility is proven to have a huge positive influence on work-life balance, an opportunity like this could be just what you need. Sign up today and become a Herbalife Nutrition Independent Distributor. You have the freedomto be your own boss and work around your own hours. Work on a part-time or full-time basis –it’s your choice. Herbalife Nutrition offers a range of activity-based ways to run your business. Whether you have an interest in general nutrition, fitness, skin or more –there will be something for you to attach your passion to. It’s your choice. With support tools and expert training you will find everything at MyHerbalife.comto build your business. 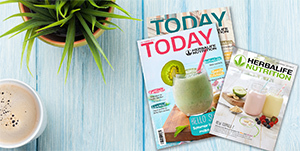 Talk about the products and nutrition with confidence and on the go with the Product Brochure and Today Magazine. Know exactly what you want to get out of your business so you know exactly where to put your efforts. Take interest in your customers. Find out what their goal is and show them how you can help them achieve it. Be a ‘product of the products’, share your results and make everyone want to be where you are.